This salad is a good example of how I love my salads in the winter – warm, hearty, and bursting with nutrition. Like a big hug. I have no desire to eat a cold salad right now (unless it’s this one, I suppose). It’s light, but still has that “stick to your ribs” quality I crave soooo much right now. Give me all the healthy comfort food! I started by roasting Yukon Gold potatoes (one of my all-time favourite winter comfort foods!) and crunchy green beans with a bit of olive oil and a generous seasoning of sea salt and pepper. While it’s roasting, whip up a batch of quinoa (speltberries or millet might be nice too) and chop some green onion and kale. Whisk together a simple red wine vinaigrette and we’ll add some freshly roasted garlic (if you are already roasting veggies, you might as well roast a few cloves of garlic too!). When the potatoes and green beans are golden and lightly charred on the bottoms, throw it into a big bowl and fold in the quinoa, dressing, green onions, and kale. 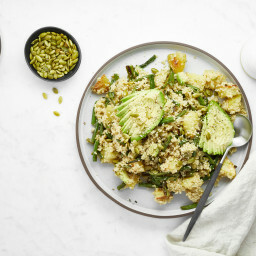 Toss on a big handful of pepita seeds for crunch and my favourite salad topper – sliced avocado. It’s the perfect soul-soothing, warm bowl of comfort food in the middle of January. This is the ultimate bowl of winter comfort food! Yukon Gold potatoes and green beans are roasted until crisp and golden and then tossed with warm quinoa, shredded kale, green onion, and a speedy roasted garlic and red wine vinaigrette. 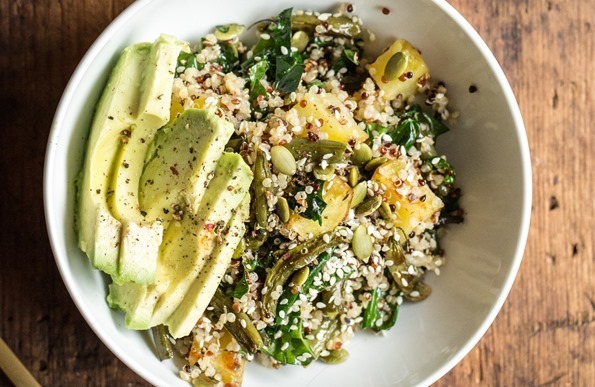 I topped this cozy bowl with crunchy toasted pepita seeds and creamy sliced avocado. Feel free to swap the potatoes with whatever variety you have on hand (yellow or red potatoes work great in a pinch). Spelt berries or millet might be a nice sub for the quinoa if you feel like changing up the grain. Preheat oven to 400°F (200°C) and line one extra-large baking sheet (or two large baking sheets) with parchment paper. Place the chopped potatoes, green beans, and garlic cloves (leaving the peel on) onto the baking sheet. Toss with the oil and season with a generous amount of salt and pepper. Spread into an even layer. Roast for 15 minutes, then remove from the oven and flip before continuing to roast for about 10 to 20 more minutes until the potatoes and beans are tender and golden brown in some spots. Meanwhile, cook the quinoa by adding it to a medium pot along with 1 3/4 cups (430 mL) water. Bring to a low boil before reducing heat to medium-low. Cover and cook for 12 to 14 minutes, until the water is absorbed and the quinoa is fluffy. Remove from heat, fluff with a fork, and leave the lid on to keep warm. Prepare the dressing: In a small bowl, whisk all of the dressing ingredients together and set aside. When the vegetables are finished roasting, trim the end off each garlic clove and push the roasted garlic out. Mash the garlic with a fork, then whisk it into the dressing until combined. Spoon the potatoes and beans into a large serving bowl. Now add the quinoa along with the kale and green onions (if using). Pour all of the dressing onto the vegetables and toss to coat. Season with salt and pepper (to taste) and top with pepitas and sliced avocado. Serve immediately. The salad will keep in an airtight container in the fridge for a few days. Leftovers can be reheated in an oiled skillet over medium heat until warmed through. It's great cold, too! Nutritional info uses 3/4 teaspoon fine sea salt in the calculation. To boost the protein even more, try adding chickpeas (roasted, if desired), adzuki beans, Great Northern beans, or lentils. A huge thank you to those of you who volunteered to be a recipe tester for my second cookbook! I’m blown away by the response – I wish I could take you all up on your offer to help. If you aren’t emailed by the end of next week, don’t despair. There’s a good chance that I will need more help in the future so I might end up emailing more volunteers down the road. I will keep your submissions on file if that’s ok with you (no pressure if you can no longer volunteer, of course). PS – I haven’t emailed anyone yet, but I should be sending out an email within a couple weeks once I get my testing site ready to roll. Thank you a million! This recipe looks amazing and is just what I’ve been craving! Can’t wait to whip it up soon! Thanks Angela! This warm salad looks amazing! The perfect winter lunch. Thanks for sharing the recipe! I don’t like eating cold salads in the middle of winter so this looks right up my alley! Raw, cold veggies just don’t sound super appealing to me when there’s snow on the ground! Agreed….I guess I just have to get it out of my head that salads are always cold and contain, you know, green salad! Absolutely love how you roasted garlic and included oh so wonderful Yukon gold potatoes. And green beans are fab too, was reading that green beans are one of the best foods for diabetics. Not diabetic but hyperglycemic so blood sugar is all over the place. Was actually advised by a trusted DR. to carry candy bars with me at all times to eat when blood sugar gets low!!! Just tried this today and it is absolutely phenominal!!! thank you! Looks awesome! Making this on Saturday! How funny you posted this! I made almost an identical salad for a Christmas celebration last weekend, except I used sweet potatoes! What a delicious salad! Sweet potatoes would be great too! I’ll have to try that. Hey, I got this recipe in MyFitnessPal with little issue. Do you paste the webpage into the recipe section?? Sounds perfect. I wish I had for lunch right now! I was just thinking about how all I wanted for dinner was a warm salad. That dressing looks delicious! How long do you think it’d keep in the fridge? I so enjoy your thoughtfulness in putting together these recipes. They are protein-packed, nutrient dense, and have a good mix of crunchy, creamy, oh-my-goodness-I’m-devouring-the-bowl appeal. Not to mention they are always so appetizing looking! From someone who is doing GF, no soy and low/no salt, I appreciate loving to cook again! Thanks, Angela! I agree, all the recipes featured are so well put together with attention to detail. Makes it really exciting to get into the kitchen and get going. I am with you on this :) I also can’t eat Carrageanen. Trying this recipe tomorrow… So excited! This is making me think that I really need to start eating warm salads. This sounds fantastic. I love warm salads in the winter too. They are so comforting! As always, thanks so much for this recipe and I will have to add it to my list! Just the title alone is calling my name. So delicious! Looks delicious. Even the kale doesn’t look overwhelming. I will give this a try sometime soon. I can’t wait to try this one! It is right in line with the season. I just made your chia power bread and paired it with a roasted veggie soup. I’ve been in search for a GF bread option and finally think I found a winner. THANK YOU! Bowls are our very favorite dinner. They are so easy and so versatile. This one looks great, I might sub roasted asparagus for the green beans. I seem to top everything with toasted pepitas! Would you be open to start listing the calories, fat, protein, carbs per serving? I’d love to see the breakdown as it would help maintain my daily intake. Thanks for consideration! This looks great! I’ve been really bored of the usual chilled salads lately. I’m so looking forward to trying this warm salad out next week! Oh yeah! This sounds great! One of my go-to easy and quick broke-grad student dinners is roasted broccoli, sweet potatoes and peppers over tricolor quinoa with lemon-tahini dressing! So satisfying and delicious!! I’ll have to put some kale into these…I am sure my bf will be thrilled for more kale!! buahahaa! Checking blogs for meal ideas. Did not know what to make for supper. Now I do , thank you. I’ve been working my way through your cookbook and I love every, single thing. My boyfriend approves too (but he requests grilled chicken on top!) This looks amazing and like the type of salad to make at the beginning of the week and toss/dress each day for lunch at the office! This looks so delicious! Warm salads are the best in winter. I can’t wait to make it this! This is going to make a perfect and packable work lunch for me this week! Can’t wait! would it be possible to leave out the oil in the dressing or substitute it for something else? It’s been so cold here in Toronto, this salad looks perfect! Love the use of potatoes and green beans. Just made this for dinner since I had almost everything on hand. I really like it! Simple and nutritious. My favorite thing about your recipes is that they make a LOT of food, so I’ll be eating leftovers for days. I did throw in a can of chickpeas for a little extra boost. It’s great! This looks so yummy and perfect for this time of year when you want something healthy but comforting. I’ve been craving avocado for days! I’m so with you on the cooked veggie thing Ange! I am a lover of veggies and eat at least one huge salad each day, but right now they MUST contain cooked veggies because raw just do not satisfy at this time of year. Comfort is where it’s at! This was even better reheated for lunch today! My daughter said it was repeatable. Hey Angela, I’m a longtime reader of your blog, but first time commenter! Love your recipes :) This recipe looks super delish, especially with the addition of potatoes! If I had to pick my all-time favourite comfort food, potatoes would be it! This salad look so good! From the quinoa to the red wine vinaigrette! This is my dinner tonight — although the cold salad that you linked to was a close second! I’m surprised you don’t massage the kale, here. I’m adding roasted asparagus to mine! I am all about the stick to your ribs feeling right now, too! 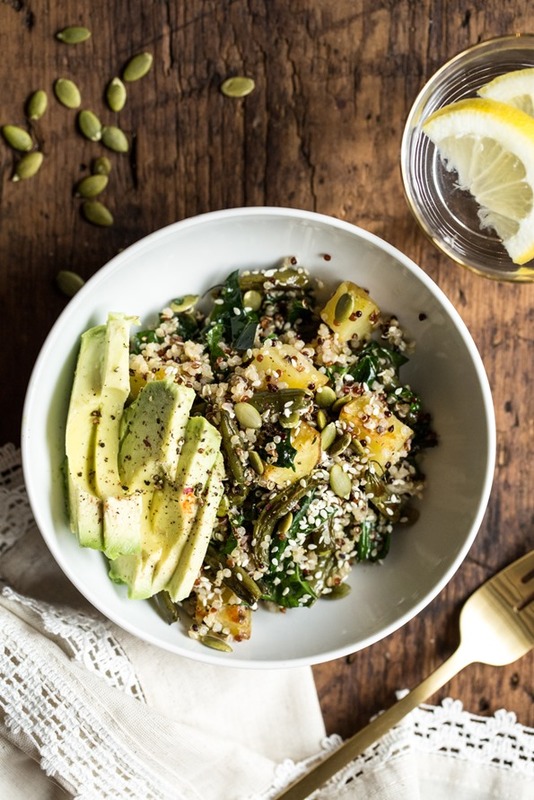 This salad bowl sounds perfect for cold evenings… I imagine myself snuggled up on the couch with this while watching Masterchef Junior. Yum! Once again Angela – you do it again! I feel the same way about salads in the winter and I can’t wait to give this a try. I’m the same way! My daily lunch salad is heated through…with kale and shaved brussells as the base. I’ll go cold when it warms up around here! This looks lovely. YUM! I love winter salads, they can be so nourishing and delicious. Roasted anything is super yummy, and topped with avocado? A win! This looks amazing! I’m not a fan of salads usually, but this is a real meal and hearty as you said – I’ve never seen this combination before in my time being vegan! (I wonder what’s the distinction that makes a dish a salad?) I’ll have to try this. Looks yummy except for the kale…just can’t do that! Maybe some Brussels…hmmm. thanks for sharing! Mmm, I love roasted veg in a salad. I guess any leftovers would be nice cold the next day. Or do you think you could reheat it?? omgosh..wow! This really is the ultimate winter bowl! And so many matches made in heaven…potatoes+green beans? red wine vinaigrette+Dijon? Brilliant. Will definitely be passing this one along to clients. I have all these ingredients here. Looking forward to having it for my lunch tomorrow. The combinations of colors and textures, WOW! I made this for my family last night. We LOVED it! This will become staple. I have been a silent follower of your blog for a number of years now and have referred many others to it. Thank you for making our lives around the dinner table fun, interesting and healthy! I love to make big roasted vegetable dinner salads in the winter! I needed a quick idea for dinner tonight and I have a bunch of Kale I need to use up, perfect! I love cooking my quinoa in some veggie broth with some no-salt Tony Cacheres for salads. Adds a little bit of spicyness to them. I’m totally making this salad this weekend. how funny, i had such a similar lunch yesterday, of course not as great as this. it had millets, spinach and avocado in it! This looks amazing! My husband is on a diet right now that doesn’t allow potatoes or beans/chickpeas. But I can’t wait until I can try this. That’s looks yummy as can be. The majority of the ingredients are in at our farmers market these days – I’m so making this! A hot salad! How perfect? Thanks for this one. Would you consider making a hot smoothie? I love how you turn greens into a comfort food! Amazing! LOVE this! I will be making this this weekend! I love the use of yukon golds…can’t get much more comforting than that! Pinned! I just made this to take to work tonight but I had to sneak a bowl early. It’s divine!!! The mix of the roasted veggies with the raw kale and onion is fabulous. The dressing is perfectly subtle and doesn’t overpower the salad. The roasted garlic is the cherry on top!!! Yum yum yum!! Oooo and I just bought a big 10-lb bag of potatoes :) This one’s now on my hit list for this weekend!! Hi Angela! This looks amazing. I wanted to ask you, how does on become considered for doing a guest post on your website? I would love to share any of my recipes, you find interesting :) I have to say, you were the first recipe I ever read about 8 years ago for my first green smoothie. In a way you helped me figure out what kale was, and how good it tasted in your monster green smoothie ;) Thanks for all of your healthy vegan inspiration over the years! It’s easy to see why you crave this salad! My 17 year old son loves it as well. I didn’t have green beans on hand so I roasted golden beets, carrots and potatoes. Delicious!! Perfect winter salad! And I could use one on this rainy summer day too :) I can just imagine how delicious all these textures and layers of flavours must be. This was our dinner and it is insanely good !!!! Can’t wait for lunch tomorrow ! Once again, you have me drooling at my computer screen. I’m a bowl addict – can’t wait to try this! That looks amazing! I wish I had some in my fridge now for for dinner this weekend! I am 100% going to try this!! For the dressing, is there an alternative for the wine vinegar?? looks great! will try tomm. We used lemon juice…was delish! Looks amazing and on my list for the menu for next week! Just made this – it’s yummy, and amazingly filling! I used fingerling potatoes and added a sweet potato to the roasted veggies, added some sauteed mushrooms, cucumbers and grape tomatoes. What a beautiful recipe!! It was a good hearty salad, but I wasn’t crazy about the dressing, too much vinegar for me. We used lemon instead of vinegar because we are huge fans of lemon. Not sure if right for others. Yummy Yummy Yummy – Delicious! The roasted garlic mashed in the dressing was something new for me, it was fun to try, and I loved it. I am an avid runner, hiker and cyclist always looking for great new recipes to help keep my fueled and satisfied. This one gets 5 stars – even my 14 year son (who’s typically won’t touch mom’s “healthy stuff” ) – ate a big serving. I substituted spinach for kale, due to a picky boyfriend. It was fantastic! I’ll definitely make it again. Oooh! Potatoes in salad are wonderful, and yet, somehow, I never think to add them. Read this and had to make it right away; after running to the grocery store. Just had the first bite… AMAZING! Thank you Angela! You are changing my life. Your recipes are so good that I have been vegan since the beginning of the year. No cravings for meat. I bought your cookbook and every recipe has been fantastic! Even my meat and potatoes husband is enjoying the meatless menu. Two words: Sweet potatoes. It added just a hint of sweetness* that matched beautifully with the sweetness* of the dressing. Perfect option if you don’t have other spuds in your cold box! *not sweet like a candy bar, but sweet as in that’s how your taste buds experience the flavor sensation! Just made it for dinner…and it’s gone. A new favorite recipe for the rotation. This looks absolutely delicious. It’s been so chilly in London over the last few days and I’ve craving a lovely warm salad. That’s dinner sorted. I will keep my fingers crossed about being a volunteer recipe tester!!! And I will be making this for sure, looks delicious! Perfect winter bowl! I added roasted chickpeas into the mix too which added a nice crunch. Very filling and reheats nicely! This was delicious! It had so much flavor. I love everything about it. I added the chickpeas, which looked a little out of place with all the subdued tones of the salad, but tasted great. I might try white northern beans next time. Thanks for an awesome Sunday night comfort dinner. I followed it up with the dark chocolate macaroon tart. Sinfully good! Made this for dinner tonight. Carnivorous husband, ornery 3 year old, and mostly veggie me all loved it – WIN! I feel as if it will become my go to “potato salad” for family gatherings. It offers so much more nutrition compared to the standard and is infinitely more delicious – thank you! It was so delicious! The ultimate comfort food! I adore ukon gold potatoes – so creamy and delicious! The ultimate comfort food! This sounds delicious. Thank you for sharing! I just ordered your book this past weekend! So excited to give it a review. My husband and I inhaled this over the weekend and sadly there were no leftovers to take to work today. I had some sweet potatoes to use up, so I substituted that for the Yukon Gold potatoes and I threw in some chickpeas for good measure. My favourite part is the crunchy pepita seeds (yum!) and my husband’s exact words were “it tastes like butter” (aka major win!). I made this recipe last night but roasted cauliflower and broccoli and some chickpeas to add with it. It was hearty and filling. My picky son even wanted to try a bite of the roasted broccoli and quinoa. My girlfriend and I are big fans, keep up the good work! I made this last night for lunch this week – so good! I did made some substitutions based on preference and what I had at home, including spinach instead of kale, apple cider vinegar instead of red wine vinegar. Also added chickpeas and avocado for serving. I think this makes the perfect lunch because it is so well-balanced nutritionally, and its delicious. I was looking forward to eating it all morning. Definitely will make again! This is perfect! I just went out and bought mason jars, glass containers, thermoses and lunch boxes so my boyfriend can stop spending all of our money on lunch. I’ve been looking around all weekend for ideas for his lunches and he will LOVE this one. I’m really looking forward to trying to make this when I finally reach home tomorrow night for the first time in a year. The idea of snuggling up inside my jumper with a bowl of this sounds great. I just made this recipe. It’s very simple and so nourishing! I love the warmth. My husband said, “Even though it was just vegetables, it was so filling and savory.” LOL. This was fantastic. It was really a big bowl of comfort as another post said. So delicious. I love how all the different ingredients melded together, and the creamy avocado was the perfect end taste. Just perfect, really. Great easy recipe and so tasty! Just made it and it hit the spot on this cold snowy day. Will add to my rotation of regular recipes. Me Hoozbeen and I just demolished a batch of this for dinner tonight, with barely any left for lunches tomorrow! YUM. It was delicious, hearty and healthy. Bonus is that it was super fast and easy to put together !! Thanks so much ! What a winner! I made this last night and my husband commented that this was probably his favorite recipe that I have made of yours! Close second are vegan enchildas with cilantro cream sauce :) Thanks for sharing and so looking forward to all the newbies in the 2nd book! Hi Angela, this is delicious and so comforting, thanks for sharing this recipe. I used spinach instead of kale (as I don’t like the flavor of cooked kale) and it was scrumptious! I made this today and was very pleased with the results. It was a perfect warm salad for a very snowy day. I used an Idaho potato and added a can of chick peas. The chick peas added an extra heartiness that was wonderful. I’m excited to bring the leftovers for lunch tomorrow…. This was good, I used frozen green and yellow beans. Will make it again. I went a little rogue with the spices, because I love indian food, and roasted the potatoes and green beans with garam masala, mustard seeds and cumin seeds. Then I sautéed red cabbage with cumin powder, and added that to the mix. Delicious! What a great salad for a cold winter night! I made this for our Sunday salad and we almost finished the whole bowl between the two of us! This recipe has a lot of my fiance’s favorites so it was easy to get him to eat this salad. Thanks so much! Holy Balls, DELISH. Can’t wait to do this one again. Totally agree cold raw salads should be completely off-limits in the winter. Like nonexistent. But this looks like one of those never get old all winter long kind of things. YUM!! I made this salad tonight and it was the BOMB! Ohhhhh so good! It’s definitely a keeper! This was amazing. Great flavour and so satisfying. I’m actually thinking of making it again this week. My daughter is very picky and not much of a quinoa fan. I decided to give this a shot and everyone loved it. My daughter had seconds!! I made a tiny bit more dressing using 1/3 cup of oil and vinegar. The kale is really good in it. So delicious and nutrient dense. Thanks so much for this recipe Angela. I made this tonight, and honestly was a touch skeptical. Greens and greens and more greens? But I added some chili oil and Parmesan on top and it was so good. What a great recipe! Thank you! I made this 2 nights ago and my family can’t stop talking about it! The next morning my daughter asked if I would make it again! We loved everything about it! This is my new favorite hearty salad! The flavors are amazing!! I had to tweak a couple ingredients based on what I had on hand: I subbed peas for the green beans and bulgar wheat for the quinoa. Sooooo tasty! This recipe was SO good!! My picky family has requested I make it again next week. This salad was absolutely delicious! My husband made it for us since I had to work late. I loved the contrast of the cool, creamy avocado with the warm roasted veggies. The dressing was very tasty and the kale really soaked up the flavor. He made it according to the recipe except I asked him to massage the kale with a little olive oil because I don’t like it when it’s too tough. My whole family loved it! Filling and comforting. This is just perfect for the cold weather we’re experiencing here. I usually go for cold salads but this looks so delicious. This is just how I love my salads in the winter too! I was going to apply to be a taste tester but readed the requirements. I just started my own blog (largely inspired by you!!!) entirely dedicated to spiralized vegetarian recipes, so I unfortunately would not commit to 3 days a week. So glad your response was great and glad to see you’re keeping well – following all the pics on the glow spot!! xoxo Love from another Torontonian! Made this two nights ago and it was wonderful! I followed the recipe exactly, but added some cauliflower to the roasting pan (because I had about a third of a head leftover and needed to use it) and everything was perfect. My seven year old son liked it so much he wanted to know if there were leftovers – I cannot think of a higher compliment! The roasted garlic elevated the dressing to a whole new level. Thank you for introducing us to this delicious salad. This looks so delicious! Definitely the kinds of foods I’ve been craving on these cold winter nights. Thanks for sharing! I made this with cauliflower instead of green beans because that’s what I had on hand, and I used a mixture of whole grain basmati rice and quinoa. It was awesome! First, this looks ahhh-mazing. Everything that I crave in the cold months too. Just can’t seem to want cold food–salads or smoothies. But I still want healthy. This is perfect! Second, and unrelated, your blog is such an inspiration; your story is such an inspiration as well. Was there ever a time when you questioned sharing it? Or when you were blogging before all the followers and cookbooks that you questioned whether or not to keep going? What motivated you to choose to keep writing, to keep trying recipes, to keep sharing even before you had the attention of the world? This winter salad is sooo good! This is seriously one of the best things I’ve ever eaten. It is SO good…SO satisfying…and it heats up perfectly. I made it last week and will be making it tonight again (and for the rest of my life!). Made this tonight for dinner and it was amazing! My 13 month old devoured it!! My husband made this for dinner tonight. Absolutely amazing!! Food is great, I’ll be your friend know special dishes. Thank you! This recipe was great! Tried it last night, but used sweet potatoes as I did not have any Yukon gold and it was just delicious! I love your recipes and use them all the time! Can’t wait for the next cookbook! We just tried the recipe for lunch and loved it. I used frozen green beans from our garden, and substituted balsamic vinegar for red wine vinegar. Definitely a keeper. This salad is AMAZING! We didn’t have enough. I can’t wait to make it again. I’m eating this right now and it is amazing! Angela, I just love your recipes and cookbook. I got it for my mother in law for Christmas and now she’s hooked too! Thanks for introducing us to delicious vegan cooking, nutritional yeast, hemp seeds, and the fact that our carnivorous spouses can in fact get by without meat. We all feel so much healthier, thanks in substantial part to you! This looks so wonderful and delicious! I’ve been trying to use more quinoa so I really want to try this. Made this for lunch today and it was soooo delicious and satisfying! Healthy comfort food at its best! Will definitely make again, thank you! Made this evening for dinner without the avocado since we didn’t have any, added mung beans for protein. Served with homemade French bread. It was wonderful. Will make again. Oh my Goodness!!! Just made this today and it was a hit!! Thank you! Super Healthy, Super delicious!! I’m going to try this tomorrow… thanks for the inspiration! I made this with my friend for a quick but healthy weekend meal – we both loved it! Making this for dinner tonight here in Connecticut where the snow, sleet and freezing rain are calling for a good comfort meal! I am going to add your suggestion for the roasted chic peas! Looks delicious! I made a similar salad the other day with grilled beans, a bag of greens, and tempeh over quinoa. The time of year begs for food like this that is warm and hearty but also hints that spring is (finally) approaching over the horizon. I made this last night, and my husband and I loved it! I subbed in white northern beans and took out the quinoa since neither of us are fans. I also sauteed the kale with a little of the dressing before adding it in, just till it was warm and slightly softer. It was filling, healthy, easy, and one of the best veggie meals I’ve made in a long time. Thank you! I only wish I had made more for leftovers! This is the absolute best salad I have ever had. My entire family loves it. I have been eating it non-stop for lunch every day for the past few weeks. So yummy! This was also amazing with edamame beans and broccoli substituted for the green beans and kale — and with hummus mixed in when ready to serve. Thank you for a delicious, energizing and inspiring recipe. I love the combination of wholesome ingredients that work together for a variety of textures and delicious sustenance. I look forward to trying this recipe out. Thank you for the refreshing new inspiration to put together a meal from ingredients not often associated together. This was so good!!! Thank you for sharing! We just had this for lunch. The process was a bit lengthy, but the end result was fantastic; worth the time it took, for sure. The oven was already hot, so I chopped and toasted the pumpkin seeds for like 6-7 mins. Delicious and comforting. It is even better than the delicata squash salad from your cookbook (my previous “favorite”). There was enough for leftovers. Will make again. I made this last weekend to have during the week at lunch and it was delicious! This is my first OSG reciple. A friend of mine, who is not vegan (I’m vegetarian) said she and her sister-in-law have made several recipes out of your book and they all turn out wonderful. I used a little less dressing to cut down the acidity for me. It was my first time using red wine vinegar, something I don’t know much about. I’m used to balsamic dressings. In lieu of avocados, I mixed in a creamy mellow yogurt. I’ve been wanting to make this ever since you posted the recipe. I finally made it today…YUM! I love it. What a great, different, winter salad. What a hit! Absolutely delicious! I’m not a big fan of green beans, so I changed them for asparragus. Yum!! Just made this for dinner and it’s SO delicious! I’ve never roasted garlic before so I was quite surprised when it came out of the oven so soft- cool! I also did not have any mustard on hand but the dish tastes just fine without. I am eating this salad as I type. It is delicious! I will make this again of course. I made this salad for lunch today and I absolutely loved it! Everything tasted so great together! Can’t wait to eat leftovers tomorrow! My husband and i made this last night….AMAZING!!!! It was so comforting and so nourishing! I couldn’t stop saying YUM! (With my mouth full of course) Thanks for sharing Angela, this one is a winner!!! Planned my entire day today around making this salad; cannot say that it was a waste! Delicious! Thank you for bringing potatoes back into my life! This salad was absolutely delicious! My husband loved it too and I have forwarded the recipe to my vegetarian daughter at college. This is definitely a keeper! Tried this last night – so filling and delicious! Loved it. Yummy! Love this! next time im going to leave the quinoa separate so i can enjoy that texture even more and it will feel more like a meal. I cooked the quinoa in chicken stock. I only had Apple cider vinegar so i substituted that for The red wine vinegar and added a teaspoon of maple syrup with a tablespoon of chopped shallots. Angela this dish is fabulous!!! My daughter ( an adult) and I have enjoyed it for lunch and dinner! I had packed some to take to work and plopped it on top my big a$$ salad for lunch and life was good! Thanks for sharing! I have tried a lot of your recipes from your web site AND from your awesome cookbook! Golden!!!! I should post more comments, cuz your recipes rock! All the best to you, your husband and daughter! Oops! Forgot all the super stars! This was down right delicious! I added some hummus and pita on the side and it was a very filling meal. Thank you so much, love your recipes! This. Was. Amazing. Thank you so much for this deliciousness. Could you use sweet potatoes instead of the yukon ones? I have made this 3 times in the past week! Delicious! It’s good as leftovers, even cold. YUM. Your recipes are honestly incredible!! I love your creativity. Cannot wait to try this one. Absolutely delicious. My 4 year old daughter couldn’t get enough of it. I used one pound of asparagus instead of the green beans. Great dish. I am adding it to my collection. I just made this today for lunch. It was amazing! I couldn’t stop eating it and didn’t even care because it was so healthy. I don’t use a ton of oil in my cooking, so I subbed out the oil in the dressing for 1/4c water, big 1/2 t. of vege broth concentrate and a big 2T of Hemp seeds to give it some fat. Delicious! LOVE the roasted garlic. I need to do that more often! Made according to the recipe, and it was fantastic! Reminded me a little of a warm German potato salad thanks to the Dijon. Yum! Delicious! I loved the combination of the roasted potatoes and green beans with the quinoa and kale. The dressing was a little strong so I added maple syrup to soften it up a bit. It would also be nice to substitute balsamic for the red wine vinegar. Made this last night…it was so good! Thanks for the recipe! I really loved this recipe. Such a great combination of flavors and the dressing really took it up a notch. I froze half of it, thinking that I would eat it way down the line, but couldn’t resist and took it out of the freezer the next week. Simple and delicious! I made this last night. It was so great. I used Herbamare to season my potatoes and I also threw in sweet potatoes. I cooked the green beans separately so they were still nice and bright and crunchy. Family loved it. I used Farro instead of quinoa. It was wonderful. Thanks I will make this again. I make this recipe once a week. It is definitely one of my favorites! This is amazing! Soooo delicious! Wow. Just stumbled across your site. This recipe looks amazing. Can’t wait to try it out. Thanks! This was so good!!! Will make it again! I am a new vegan and new to your blog. I am really enjoying both. I made this for supper tonight and it was really flavorful and filling. I’m struggling a little with not eating as many calories as I probably need, but this hit the spot. It was super simple to make and I’ll have leftovers for lunch tomorrow. Yay! Thank you. This looks so delicious! I can’t wait to try this out soon! Living just outside Boston this winter has been a challenging one. I made this one of the many nights we were shoveling ( again) another foot + of snow. I kept telling my husband it was a “winter” warm salad. Well it was perfection in a bowl! We both loved it & felt it was perfect after another long day shoveling. Been eating this for lunch the whole week. Absolutely delicious! I’ve been making recipes out of your cookbook lately too and they have been great. Thanks for the fantastic recipes! This was delicious! We had a lot of winter weather hit within the last two weeks, and this was such a great dish to make and have on hand for those cold days. I very reluctantly went vegetarian this week in an effort to bring my cholesterol down. This dish just made it worthwhile. I sub’ed out the Yukon potato for a sweet potato and it was a perfect match! I never usually leave comments on websites but I had to let you know how much I appreciated this recipe- it’s amazing! I recently became a vegetarian and this recipe will definitely be a staple! I’ve literally made this recipe like eight times already, and I’m making it again tonight. It is SO good and simple! This recipe has been on my list to try since it was posted. Tried it tonight and I cannot get enough!!! So tasty. Definitely going to be a regular for our table. Wowza! I was looking for something easy to make for dinner. This is off the hook! I’m obsessed! Going to make more for lunch tomorrow. Thanks for an awesome recipe! This was so good! I made pork chops, roasted veggies, and green beans for the family and then quietly enjoyed my warm and insanely good winter salad. The combination of the steaming quinoa, caramelized roasted veggies and cold and crunchy kale and green onions was so satisfying. I made the vinaigrette, but opted for a tahini sauce instead given that it was already on the table. Thank you, it was lovely! This would be a dream!!! I have fallen in love with your cookbook and the recipes on your website. I would love to be a tester, keeping my fingers crossed. I loved this! The dressing was so light and perfect. It wasn’t overpowering but it definitely added to the meal. Out of all the complicated meals I made this week this one was the simplest yet most satisfying. I will make this again, no question about it. Does anyone know if this is re-heatable? I’d like to take it into work with me for lunch! Spring just doesn’t seem to be coming yet, so I’m still in the mood for comforting winter foods. This warm salad might just do it! Delicious!!! I didn’t have green beans so I used asparagus instead. This recipe is a keeper. Thank you! This is one of my favorite things I’ve made in a while- so tasty and very hearty! Can’t wait to have leftovers today. One of our top favorite recipes and it was also filling! I almost couldn’t finish my bowl of salad and I eat a lot. :) and we felt great afterwards. The dressing really ties everything together. I plan on making this again and again. Thanks! Do you think the recipe would work as well if I replaced the string beans with asparagus? Holy smokes Dr. Jones! This recipe was one of the very first vegan recipes I made when I decided to experiment with vegan meals. I have been straight vegan and gluten free now for three weeks and I cant tell you how much fun I am having cooking this way! This recipe is so freaking delicious! All the ingredients just go so well with one another. I have made this twice in 3 weeks! Even my fiancé loved it! I like to roast the potatoes a bit longer because I like the crunch. The roasted garlic in the dressing!!! What!?!?!? So yummy. I have made a few of Angela’s recipes and I gotta say she was the one who proved to me that eating vegan is not boring! This is definitely a go to in our house now! I made this last night to pack for lunches – it’s so delicious! The dressing is perfectly balanced with the ingredients. Thank you, Angela! Dear Angela, what I need to know is: do you really use FRESH green beans? I always thought they MUST be boiled before eating them….? This was fantastic! Scrumptious and satisfying. So many delicious flavors. We added some cayenne pepper and loved it even more. This looks and sounds delicious. I love this type of salad, hearty and fresh at the same time. I just made this last night (it’s perpetual fall in SF!) and I substituted swiss chard for the kale. IT WAS AWESOME. My husband loved it. Super easy and just plain tasty. I plan to make it again in a few days =). Thank you for this – and all your other – amazing recipes. Your friend, Heather, from Nosh with Nash, sent me the OSG cookbook after visiting me here in Colorado. I’m hooked and so thankful for healthy recipes that taste amazing. Just made this for dinner tonight and loved it! I know it’s not winter but the ingredients are in season now anyway and I was craving something a bit more hearty. Definitely one to repeat. I was skeptical about the dressing, but it really pulls it together! Especially with the green onions, mmm! This is my new favorite dish. I make it all the time. When I tasted the dressing I thought I wouldn’t like it but it is so perfect for the dish. I’ve also tried it with roasted sweet potatoes or turnips for something different. I made this recipe EXACTLY as suggested. And oh…my…god. I knew it would be good but I had no idea just how ridiculously delicious it would turn out. This is coming from a brand new vegan who honestly doesn’t really like a whole lot of “healthy” foods, so I was worried about this journey. Thank you so much for sharing such an exquisite warm salad. This is my new go-to lunch for long days in the lab. I made this two days ago. It was a hit! I am vegan and my husband is not so it is always a challenge to creatively make vegan food he will eat. I made this and we both loved it! I also love that it keeps well in the fridge. The only thing I would modify is the amount of vinegar in the dressing. I would probably go 1/4 cup oil and 1/8 cup vinegar….but only because I am not a huge vinegar person. All of the ingredients in this salad blend so well together. This is one of my favs Angela-thank you! I made this recipe the other night and was so pleased! I added a few things, such as black beans, and switched out the Yukon’s for hearty purple potatoes. The prep was easy, and it didn’t take too long to make. I found myself satisfied with a full tummy. My mother-who is very skeptical to try vegan recipes- loved it! Thanks for another winner! I just made it! Added chickpeas and the suggested sesame seeds. Awweeeesoommmmmmeee. This salad was delicious, filling, and really hit the spot on a chilly day! My 11-year-old daughter so liked the dressing, that it’s now her default for other salads. This salad is absolutely amazing. I have been sick all week and barely eating so this is exactly what my body needed. I added roasted chick peas and they add a nice crunch. Will definitely make again! This was fantastic! We added some chunks of carrot to the roasting pan with other veg. We used lemon instead of vinegar and folded the kale into the roasted vegetable when it came out of the oven just to wilt a bit. Thanks! Made it again with added carrot to the roasted veg and used lemon instead of vinegar…just as fantastic as before! Thanks! We are eating vegan for 30 days (hopefully longer, but 30 days is our first goal), and this dish got us off to a spectacular start. Thank you. Delicious, full of flavor and texture. Thank you for this great recipe! It brought sunshine to the dark and cold winter days here in the Netherlands. I made this last night – DELICIOUS. Eating the leftovers at work right now – they’re awesome cold. Thanks for fueling my vegan pregnancy! I just made this and I have to say it was absolutely delish! Thank you…this will be in regular rotation! My husband and I are not vegans, but we try and eat mostly plant-based. This recipe changed the way we thought about vegan dinners; it’s so delicious, comforting, and filling! He even asked for it for his birthday dinner this year (last year was tri-tip)! I have also mixed it up with the veggies and added cauliflower, broccoli, and brussels sprouts (chopped somewhat small), all of which were a great success. Thank you, thank you for this goodness! Best dish ever!!!!! I’ve made it three times within the past month. I brought it to a holiday party that was loaded with meat and unhealthy options, and it was a total hit, the dish was gone fast and everyone wanted the recipe! Oh, I’m so happy to hear it was a hit, Joy! Love love love this!! Made it tonight – I live in Winnipeg so the idea of a warm salad was incredibly appealing!! My green beans had turned so I replaced them with what I had on hand – a few small carrots and red onion. Still turned out fantastic – awesome dressing! Thank you Angela – this is the second recipe of yours I have I used in the past week that turned out great!! I’m glad to hear it, Angie! I hope you enjoy whatever you try next just as well. Stay warm! Thanks for the recipe. This salad was awesome. I made it last night. We really enjoyed it! I am trying to go oil free. With your dressing what would I replace the olive oil with? Hi Dianne, I’m sorry I really don’t know of an alternative. You might be able to get away with using a bit more vinegar and then adding some liquid sweetener to offset the vinegar tartness. Pleas let us know if you try anything out! Just made this and OMG it was was INSANELY good! I changed it up a tiny bit – used broth for quinoa instead of water and sauteed/steamed the kale & green onions instead of raw (I don’t love raw kale). This really turned out great! Next time, I might use sweet pot instead of reg – just to see how that goes. My roommate and I discovered this recipe about a year ago and it is now a house staple. We often change it up with the roasted veggies as well, and add cubed sweet potatoes and also BEETS (which turn the quinoa a bit red, but it makes for perfect Christmas colours so that’s cool!) yum. Good change! Thanks, Bekah. I will use this recipe many times for my family. Very tasty and light. Loved it! Hm. I love all these ingredients… But I found the dressing sooo vinegary! I actually came back to see if I added too much vinegar but it appears I followed the recipe exactly… I think it needs way less! And I’m a vinegar fan. I’m going to try adding some more olive oil to my leftover dressing. The salad is nice, but the sauce has wayyy too much vinegar. Avoid that 1/4 cup vinegar and add fresh lemon juice in the next batch instead. Hey N, Thank you so much for the feedback! I do love a tangy dressing, but I understand it’s not everyone’s cup of tea. A quick fix for a dressing that’s too acidic is adding a bit of sweetener like maple syrup and a bit more oil. I’d love to hear how the lemon version goes next time, though! Hey Gabryelle, Thank you so much for your feedback! I love your tweaks. :) I’m going to make a note in the recipe about the dressing too, thanks! If like to make this for a baby shower…will it be ok if I make it in the morning and then re-hear right before serving? Any other suggestions?? Hey Angela, If making it in advance I would suggest leaving off the dressing and mixing it in right before serving. Hope this helps! Made this for supper tonight. As all the other reviews stated, it was delicious! Can’t eat potatoes so I used cauliflower instead. I don’t usually like sweet but I thought the dressing was perfect. I will be making again! This recipe is one of my favorites. The only thing I would disagree with is the serving size, this definitely is not six servings, my husband and I ate all of it in one sitting. So if you want leftovers I would double it. So glad you enjoyed it Tara!! This was simple and delish. I used lentils for extra protein and subbed out toasted pine nuts for toasted pepitas since I had them on hand. Will definitely make again. My boyfriend loved it! I would agree with Tara though that this was not 6 servings – I got about 4 out of it. Too good to only eat a small portion!